Flynn: At first we were almost strangers. But ever since I moved to New York, Amos was the one person I could count on. And together we were there for Poppy. (I mean, what kind of parents leave their kid to be raised by a nanny?) I just didn’t expect to fall for him—and I never expected him to leave us. Amos: I thought I was the only one who felt it. I told myself it was because we were spending so much time together—taking care of Poppy and all. But that night, I could tell she felt it, too. And I freaked out—you’re not supposed to fall for your stepsister. So I ran away to boarding school. I should have told her why I was leaving, but every time I tried, it felt like a lie. One missed flight was about to change their lives forever…. I was excited to read this book as it was giving me somewhat of a Gayle Forman's Just One Day vibe. Although I did have some different feelings throughout the book, this book still left me glad that I decided to go on this adventure that started with just one missed flight. We follow Amos, Flynn and Poppy. With chapters interchanging between the two of them we get a full exposure of the mixed emotions, the unsaid words, and the longing to go back to how things were before. Getting the news of upsetting news the three decide to take one last adventure together as a family. The chapters were short and very fast paced which made this book a quick read. I just remember starting chapter one and a couple hours later I was see the last page turn. I had no idea where the time went but this was a book that was able to keep me hooked to the very end and it kind of makes me want to have my own little adventure. Looking at Flynn and Amos, you can immediately tell that there is some baggage between the two. Throughout the story the two's emotions are constantly being pushed to their limits and it is just a matter of time before someone cracks. I did feel like I would have wanted just a little bit more of character development and a closer look at their past. Especially when we bring in secondary characters. However, this was not an issue with the overall story and my end opinion on the book. 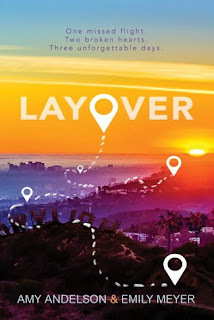 If you are looking for a book that is a fast read full of adventure and taking risks, Layover is the book for you. Both authors write a brilliant story wrapped around a topic that is not unfamiliar to teens. A light-hearted read for the perfect afternoon!